typeof is converted into a constant at compile time and GetType returns a reference to the run-time type of your object. But what about Type.GetType(string)??? A colleague of mine suggested to check that Type.GetType(string), formerly the method I needed to use, is not too slow and that it doesn’t generate garbage either. Mobile game developers must be very careful about this aspect. If the garbage collector kicks in to release unused/unreferenced objects within a game loop, where each frame must be no longer than 16 ms, it likely will create stutters and it will bring down the frame rate resulting in an unpleasant experience. While this aspect might not be a problem on PCs, it is instead a big deal on mobile devices. DummyClass is an empty class that I used just for testing. 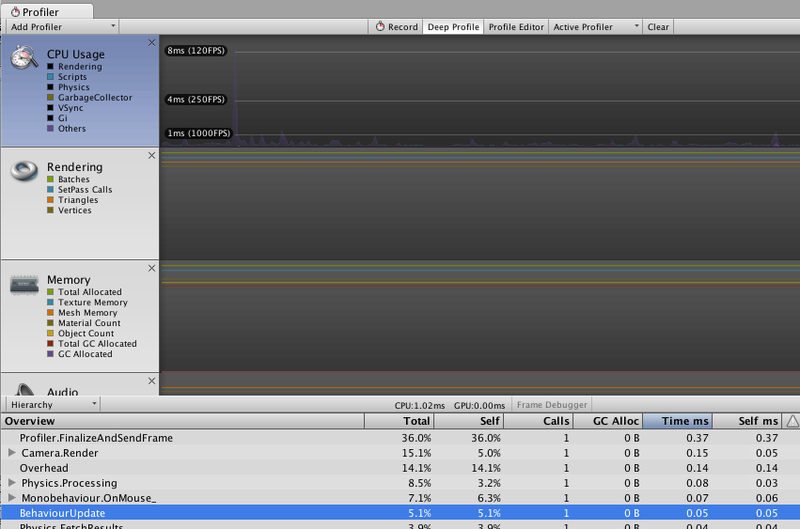 Running the project in the Unity Player and looking at the profiler I noticed that no garbage was generated (look at Figure 1) and the time taken was very good too (~0.05ms). Incredibly, the same exact call to Type.GetType(string) generates 178 bytes of garbage each iteration, forcing the GC to collect memory at some stage. Time taken to execute it is approximately 0.5 ms. Retrieving a type from its string representation generates indeed garbage on iOS!!! However, I still wanted and needed to use Type.GetType(string) to avoid a lot of code duplication. The only workaround that I thought of (and I like to see in comments your solutions or ideas too 🙂 ) was to use a very simple cache mechanism. What this code does is very simple. If the requested type is not in cache, defined as a readonly static dictionary, then the type is retrieved and after stored into the cache. If the requested type is instead already in cache then…well it’s just simply returned. This mechanism generates garbage too, of course, but with an improvement. 178 bytes (or more depending on the type) are generated only the first time you request a type that has never been requested before. I tested this solution on a iPad 4. The solution was compiled using Unity 5.2.1f1 and the iOS app generated using IL2CPP. My goal was to determine if that worked well, if it wasn’t too slow and most importantly if there weren’t memory leaks of any kind. As you can see in Figure 3, on the first access, 2.7KB of memory were allocated for initialising the cache object, but on successive accesses no garbage was generated anymore (see Figure 4)! 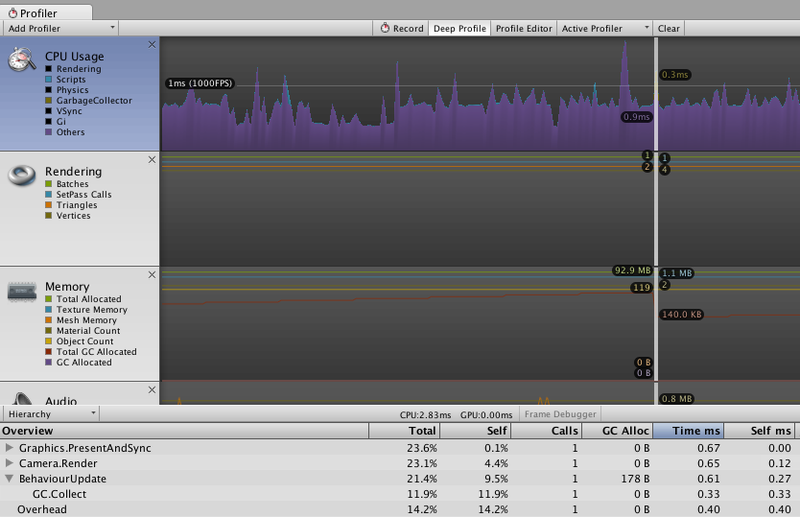 Moreover the time to retrieve a type went from 0.5ms to 0.03ms, almost the same time it took on a Mac!!! As you see, using reflection on iOS might be dangerous. You should always check that no hidden garbage is generated outside of your control. Sometimes, a very simple cache mechanism, like the one I implemented, can literally save your day. I hope and looking forward to seeing your thoughts about this topic. See you on the next coding adventure! that is actually a really good point! Thanks for pointing that out, I’ll update the code and the article.